The name Orissa is derived from the Pali or Sanskrit words Ora (Ura) or Odra Desa or Sumera or Odra Visaya The earliest epigraphic reference to Odras is found in the Soro copper plate grant of Somadatta from which it is clear that Uttara Tosali with its visaya Sarepahara identified with Soro of Balasore (Baleswar) district was part of Odra Visaya.Both Pali and Sanskrit literatures mention the Odra people as Oddaka and Odrah, respectively. Ancient writers like Pliny the Elder and Ptolemy described the Odra people as Oretes. In the Mahabharata the Odras are mentioned along with the Paundras, Utkals, Mekalas, Kalingas and Andhras, while according to Manu the Odras are associated with the Paundrakas, Dravidas, Kambojas, Yavanas, Sakas, Paradas, Pallavas, Chinas,Kiratas and Khasas. Odisha has a history spanning a period of over 5,000 years. Before Kalinga it was named as Udra or "Odra Desa". The Ancient Odra desa or Ordesa was limited to the valley of Mahanadi and to the lower course of Subarnarekha River. It comprised the whole of the present districts of Cuttack and Sambalpur and a portion of Midnapur. Unlike some other parts of India, tribal customs and traditions played a significant role in shaping political structures and cultural practices right up to the 15th century, when Brahminical influences triumphed over competing traditions and caste differentiation began to inhibit social mobility and erode what had survived of the ancient republican tradition. A major turning point in world history took place in Odisha. The Kalinga War that led emperor Ashoka to embrace non-violence and the teachings of Buddha was fought here in 261 BCE. Ashoka's military campaign against Kalinga was one of the bloodiest in Mauryan history on account of the fearless and heroic resistance offered by the Kalingas to the mighty armies of the expanding Mauryan empire. On the other hand in the 3rd century BCE, in the eastern part of Odisha, Kalinga flourished as a powerful empire under the Jaina emperor, Kharavela.It also was a part of Harsha's empire. In 795 CE, the king Jajati Kesari I of Kesari or Soma dynasty of Kosala united Kosala and Utkala into a single empire. He is also supposed to have built the first Jagannath Temple at Puri,although the current structure of the temple is entirely different and was built by Kings Choda Gangadeva and Ananga Bhimadeva of the Eastern Ganga Dynasty in the 12th century. The famous Lingaraja temple in Bhubaneshwar was started by Keshari dynasty king Jajati Keshari III and completed by his son Lalatendu Keshari in the 10th century. King Narasimha Dev is reputed to have built the magnificent Konark Sun Temple. 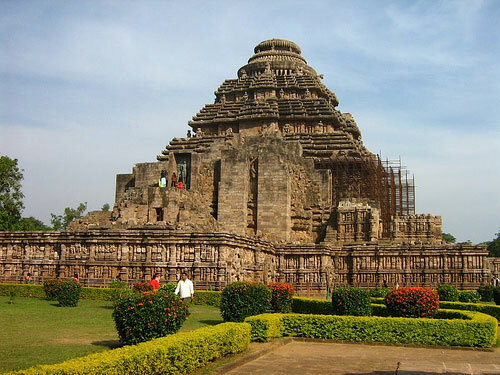 Bhubaneswar is the capital of Odisha, and home to nearly a thousand temples. Cuttack, the former capital of Odisha, is 22 km from Bhubaneswar. With the rapid expansion of two cities and better road connectivity, the two cities are now almost conjoined and considered as twin cities. The city of Puri is about 60 kilometres from Bhubaneswar and lies on the coast of the Bay of Bengal. Puri is considered a holy city and the abode of the deity Lord Jagannath. It is one of the Char Dhams (Four holy places) of Hinduism. The world-famous "car festival" (rath yatra) is celebrated every year in the Hindu month of Ashadha (Mid June to Mid July) in Puri. Although most of Odisha's forest cover has been denuded lately, one of the greatest attractions of Odisha is its still vast expanses of unspoiled natural landscape that offer a protected yet natural habitat to the state’s incredible wildlife. There are many wildlife sanctuaries in Odisha. The Simlipal National Park Tiger Reserve is a huge expanse of lush green forest with waterfalls, inhabited by tigers, elephants, and other wildlife. The Bhitarkanika Wildlife Sanctuary has been protecting estuarine crocodiles since 1975.Chilika Lake, a brackish water coastal lake on the Bay of Bengal, south of the mouth of the Mahanadi river, is the largest coastal lake in India and the second largest in the world. It is the largest wintering ground for migratory birds on the Indian sub-continent. It is protected by the Chilika Lake Bird Sanctuary, which harbours over 160 migratory and resident species of birds. It also has the small area of Satpada which is a safe sanctuary for the lesser known and endangered Irrawaddy Dolphins. By Air: The city Bhubaneshwar has the only airport in the state. It caters to domestic flights alone, and regular commercial flights from Kolkata, Delhi, Chennai and Hyderabad. By Train: Bhubaneshwar and Behrampore are the two railheads in the state that are connected by trains to all the other metro cities of India like Kolkata, Mumbai, Delhi and Chennai. By Road: From Kolkata, Raipur & Visakhapatnam neighboring Andhra Pradesh.